We at JUMP UP have been fans of SOLOMON JABBY for years – we are so proud to finally be able to work with him! As the guitarist and one of the original members of Christian roots reggae powerhouse Christafari, SOLOMAN has toured the world ’round and recorded a dozen plus albums. But much of his work has been overlooked in the “secular” market. This 7″ single will change that! Two BLAZING early reggae instrumentals with grinding organ – everyone who I have played this for so far immediately thought it was THE AGGROLITES or a ROGER RIVAS solo record! THESE TWO TRACKS are THAT GOOD! 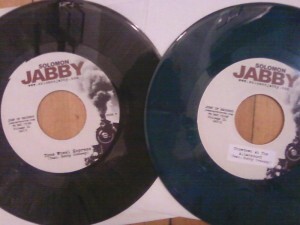 As always, released on Limited Edition random colored vinyl! You can hear this on on our Soundcloud page! 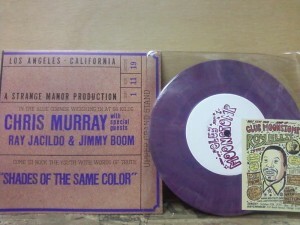 Early in 2010 BABYLOVE & THE VAN DANGOS toured with CHRIS MURRAY in Europe, and we produced this single for the tour! BABYLOVE delivers “I WANT YOU HERE” and CHRIS MURRAY sings “SHADES OF THE SAME COLOR”. Color wax, cool train ticket artwork! Sorry, out of print. 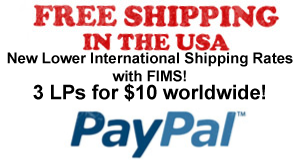 Next post: LOWER International Shipping through FIMS: Fed Ex International Mail Service! 3 LPs for $20 postage!